Han Bi-ya, 51, a celebrated travel writer and relief worker, recently appeared on a television show and talked about her tough but inspiring career to the audience. Her story about the unusual experiences and exploration of the world�s remote areas was the talk of the town and has immediately pushed her latest book, "It Was Love," a collection of essays, to the top of the bestseller list. The book is gaining popularity mainly due to her reputation as a bestselling travel writer but also because the untold stories reveal the decision behind her new career. Han, who leads an emergency relief team at World Vision Korea, went to the United States to earn a master�s degree in humanitarian assistance at Tufts University near Boston, Mass. Renowned for her best-selling book �March to the World, Off the Map,� which inspired readers to achieve their dream and explore the world, the author has been regarded as one of the most desirable women in Korea in many surveys. "It Was Love" was coincidently released as she quit working at World Vision Korea in July after working for eight-and-half-years to study abroad. The author tells her stories in a casual way by looking back to her relief works in disaster-stricken areas and private emotions. 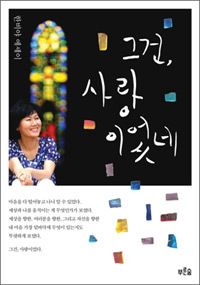 In this book, Han confesses her distress and the solitude behind her energetic, cheerful and even hyper image. She was shocked by the traumatic scenes such as hundreds of corpses left in disaster areas in Indonesia in the wake of the tsunami in 2004. Han has wrestled with such psychological traumas to continue her mission to save refugees who need emergency relief. But, she says, sometimes she needs cheer when she is dragged into depression and fatigue without any reason. "I don�t think cheering means encouraging a boxer knocked down on the ring to stand up and fight again. It�s easy to cheer up someone who is doing well. But it needs careful considerations when we cheer somebody who falls down on the ring of `life.� We should understand the state of the person who falls down on the ring to encourage and respect his or her decision and instead calmly comforts," she said. Concerning her reputation as a role model for many youngsters, she thinks it weird that she was put on the list. "I don�t understand why I was chosen alongside other powerful figures. I don�t have any influence to change the nation nor am I beloved by many people. But the only reason I think it might be is because I changed the standard of success or at least diversified it. Of course, still, power, influence, money and popularity are the keys to someone�s success. On the top of that, I might add one more thing to it � regardless of money or social status, just doing what I want to do and live freely and help others," she said. Han pointed out that visible success is not everything and, instead, other merits should be included � helping, encouraging others, and pursuing their self-established principles and faith. The traveler reveals her humble lifestyle which was formed during her travels around the world, mostly on foot. She says that while on the road, she carries a 40-kilogram backpack. "While I am wearing a heavy backpack, I realize that having many things doesn�t give me freedom but rather a shackle. On the trip, we can realize that there are not many things necessary for our daily life," she said. Han also mentions global leadership which is emerging as a campaign in government and corporations. However, she points out the widespread misunderstanding of true global leadership. She says that in most cases, global leadership often focuses on how the nation has a competitive edge over others and how much money can be earned in the global market. "If the nation truly wants to be the global leader, it should have the soft power that shares the global problems the minorities are suffering in international society and the efforts to resolve them, along with hard power such as economic or military power," she says. She emphasizes that to become a global leader, it is necessary to become a global citizen first. As the leader of the relief team, the global citizen should recognize the world as a joint community to struggle with global problems together and pay attention to the backward countries which desperately need help. "I don�t think the global citizenship is optional. It�s the `spirit of the times,"� she says. Toward the end of the book, she expresses her deep appreciation for the heightened awareness of Koreans who support global relief activities. The number of patrons for World Vision Korea has risen from 20,000 in 2000 to 330,000 in 2009. Han first became known for her travel books such as the four-volume best seller, "Daughter of the Wind: Three and a Half Times Around the Globe on Foot," an account of her seven-year travels. She quit a high-status job at Burson-Marsteller, a global public relations and communications firm. Han then explored the world, particularly a number of remote areas, alone and on foot. In some countries such as Afghanistan, she put herself in hazardous situations and was lucky to survive. During her travels, she decided to devote her life to helping refugees as a volunteer worker. Han graduated with a degree in English Literature from Hongik University. Since 2001, she has been involved in international emergency relief work, leading the Emergency Relief Team for World Vision Korea and contributing to raising awareness of international relief issues in Korea.